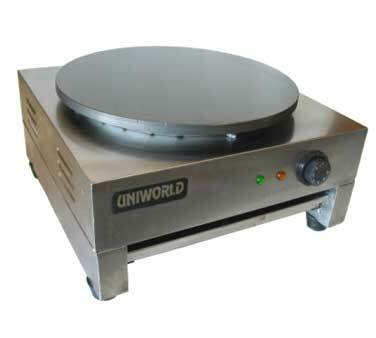 Crepe maker is 15.75" round with heavy duty carbon steel plate and adjustable control knob. Stainless steel body. 110 volt easily plugs in. Adjustable thermostat with 1600 watts of cooking power. Easy to operate and clean. CE approved. One year manufacturers warranty.